When I worked in Burkina Faso, I would often travel between Ouagadougou and Bobo-Dioulasso. That would take me past the town of Sabou which had a small lake infested with crocodiles, sacred crocodiles. By sacred, they did not mean that people worshiped the crocodiles. Rather, they did not kill or harm them. Even better, they fed them. It was a tourist attraction. Because the crocs were well-fed, they were somewhat docile. With the help of a local guide you could pick up the tail of one sunning itself on the shore, which is where I always found them. Usually, the guide’s assistant would distract the crocodile with a chicken tied on a string at the dangerous end while the tourist picked up the tail at the other. One day, I found myself driving through Sabou and decided to make the short detour to see the crocodiles. I arrived to find the place deserted. No people, tourists or guides, and no crocodiles. I got out of the vehicle to stretch a bit. Shortly a young man came rushing toward me. “Bonjour”, he said. Did I want to see the crocodiles? Of course, I replied, but it seems that I am unlucky today. “Pas de problème ” (no problem), he answered. “Pas de problème” is the Burkina Faso equivalent of hakuna matata (from The Lion King). Quickly, before I could get out of my stunned state and react, he stripped down to his underwear, walked out into the lake and came back dragging a 12 foot long crocodile by the tail – all for my viewing pleasure. Needless to say, I gave him a nice tip. 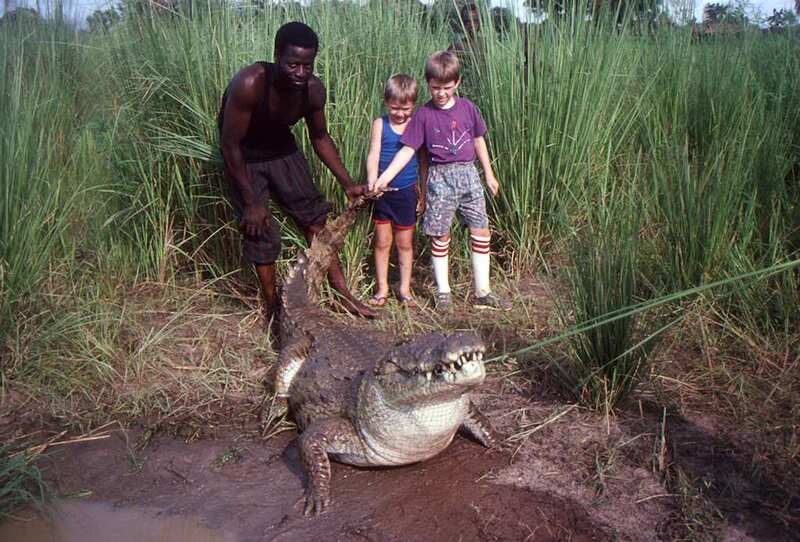 This entry was posted in Africa, Animals, Burkina Faso and tagged crocodiles, Sabou, sacred crocodiles. Bookmark the permalink. I remember those crocodiles so vividly.That was so much fun!